Planets with volcanic activity are considered better candidates for life than worlds without such heated internal goings-on. Now, graduate students at the University of Washington have found a way to detect volcanic activity in the atmospheres of exoplanets, or those outside our solar system, when they transit, or pass in front of their host stars. Their findings, published in the June issue of the journal Astrobiology, could aid the process of choosing worlds to study for possible life and even one day help determine not only that a world is habitable, but in fact inhabited. Volcanism is a key element in planetary habitability. That's because volcanic outgassing helps a planet maintain moderate, life-inviting temperatures, regulating the atmosphere by cycling gases such as carbon dioxide between the atmosphere and the mantle. Lead author Amit Misra, who has since graduated with a doctorate, said the project started in a UW astrobiology graduate seminar when a professor asked how one might detect plate tectonics—the grinding together and apart of huge slabs of a planet's surface—on faraway worlds. Plate tectonics is considered an aid to the origin of life because it allows for the recycling of materials from the atmosphere to the planetary interior. Some scientists have even proposed that life on Earth began at sites created by tectonic plates. The students studied various models trying to predict whether an exoplanet might have plate tectonics, but found little in scientific literature on how to directly detect tectonic plates. So they started brainstorming. "I came up with the idea of looking at explosive volcanic eruptions as a proxy, or stand-in, for plate tectonics," Misra said. "I had done some work modeling aerosols produced by volcanic eruptions for other projects, so I started looking into how we might detect an eruption and what it would tell us." So the team used data from volcanic eruptions on Earth to predict what an Earth-like exoplanet might look like during such eruptions. The thinking, Misra said, was that explosive volcanic eruptions usually happen at the edges of tectonic plates, making them a good proxy indeed. Gases released from smaller, nonexplosive volcanic eruptions tend to return quickly to the planet's surface. 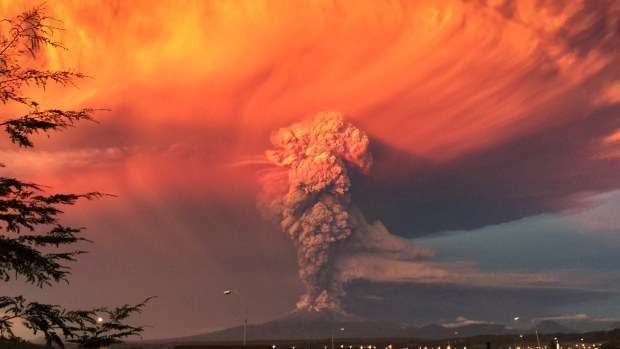 Explosive eruptions, however, can send volcanic gases up into the stratosphere, where they "greatly affect the spectrum of the planet," Misra said. The optical signature of the gases might be detectable by powerful telescopes such as the James Webb Space Telescope, scheduled for launch in 2018. Co-authors are Joshua Krissansen-Totton, Matthew Koehler and Steven Sholes, all graduate students in the UW's Department of Earth and Space Sciences and affiliated with the UW astrobiology program. But while the connection between volcanic eruptions and tectonic plates is true on Earth, Misra said the team cannot say with certainty that the same is true throughout the cosmos. Still, he said, "An explosive eruption can probably be tied to volcanism if false positives such as dust storms can be ruled out." "These long-lasting, high-up aerosols can have a huge signal for an exoplanet, which is the key result for the paper," Misra said. "What this means is that if we can detect a volcanic eruption on a planet, and if it meets other criteria like being in the habitable zone, that planet should move up our list of potential targets to search for life." The work may also someday help astronomers infer that a planet not only might have life, but actually does. Misra explained that while oxygen is thought an indicator of life, it's also possible for oxygen to be produced abiotically, or by something other than biology. Volcanism, Misra said, may help distinguish between oxygen that is produced by life or other planetary processes by helping astronomers better understand the planet's environment. The research was done through the Virtual Planetary Laboratory, a UW-based interdisciplinary research group, and funded through the NASA Astrobiology Institute.